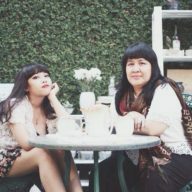 Rain Chudhori, whose debut short story collection was published in 2015 and is now in its third imprint, interviews her mother Leila Chudhori, award-winning script writer, novelist and short story writer, about Jakarta, the megacity they both call home. Why is Jakarta important to you? Jakarta is important to me because that’s the city I was born in and grew up in. Every time I go abroad or go out of town, I’m always looking forward to going back to Jakarta because it’s my home. Jakarta is about comfort because it’s about home. That’s the first thing I think about when I think of Jakarta. The other thing is also familiarity. I know where things are in Jakarta, and that’s very important. I know where the good foods are, I know where to find books, or where to repair the car or shoes or whatever. So, I think Jakarta has been a part of me since I was really, really young. It’s very difficult for me, to imagine myself living in another city. I can do it for a while, but I don’t think I can do it for good. Do you think that has something to do with where you are in life right now – placing importance in routines and familiarity? Ever since I was young, I knew that I couldn’t live in another city or country for good. I could live somewhere else for several years, to study or to do a writing residence. But I don’t think I could leave forever. It’s very important for me to know where things are, and it’s important for me to feel comfortable. And I know Jakarta in a sense is… it’s polluted, the traffic jams are infamous, every foreigner asks me whether the traffic jams are as bad as they say. The architecture of the city is horrifying. It was never planned and doesn’t have a long-term plan. One governor would build something, and then the next governor will build another thing. It’s a city that depends on who the governor is. Every governor has different policies. So of course I know all the downside of being in Jakarta, but I think I’m used to it. I still think that if I have choices, I still prefer to live here. I was thinking a long time ago that it would be nice to spend my retirement in Bali, but it’s very hot, it’s very humid, and I thought I cannot spend my day taking showers all the time. And then I thought of living in Bandung, Jogjakarta, and I thought no, I have to live in a place where I’m comfortable. When I was studying in Canada, I knew that I had to go back to Jakarta. I love being abroad, I spent 6 years there, but I had to go back. I don’t know what the magnet of this city is. I’ve always asked you why you went back to Jakarta. I could never understand that. Somewhat. I still don’t understand completely, because I think I’m at a point in my life, where I feel like Jakarta is suffocating. Especially the last few months, I felt that the city was really toxic, and there was so much pressure and chaos. It was just a lot. It’s a lot to live in Jakarta. I understand that. All the pressures and what I cannot stand is being in a car in Jakarta. It’s such a breeze being in a car in other cities. It’s so different from being in a car in Jakarta. But still, if there’s a problem in Jakarta, I know how to fix it. If plan A doesn’t work, I know what plan B is. If I’m in another city, of course I have to adjust, but it’s different. In Jakarta, I know what to do. So it’s about security, I know what to predict. It’s not just for locals, I feel like Jakarta can also be easy for foreigners, if they have privilege. I remember when Max (my German partner) came here, and was astounded how easy everything was. If we’re hungry, we can eat at home where there’s a cook, or we can go out, or we can order in. If we needed transportation, we had a car, or we could go on a Gojek, Uber, Grabcar, Bluebird. All you need is your phone, and you could have anything you want. It’s not like that in Essen (Germany). Yes, and also in other Western countries. It’s not just about that comfort, but it’s also that I’m a writer, and you’re a writer, there’s certain things here that makes it comfortable to write. I like to write in bed, or if it’s outside, I like to write in my office or cafes. If I’m abroad, I could write, but not as much, not as long. I would only write, maybe two or three pages. The longest I wrote in another city was in Jogjakarta. I wrote some chapters of Pulang there. But that’s it. Since I’ve been in Ubud, I’ve only written a few paragraphs. Being outside of Jakarta is difficult in terms of writing. It’s the same way with me. I didn’t write my first month in Germany. I was trying to adapt and taking care of the move, but after I found some time, I find that I write relatively slower. A little. In Jakarta, there were so many things that I had to do every day, but when I found time to write, I would finish two to three pieces a day. You know I write in cafes because I like the noise, but here, you can’t write in cafes. You stay in a cafe for only one to two hours here, you don’t really go there to work, so no one really brings their laptops, there’s not a lot of plugs, and there’s no public wi-fi. European cities are like that. American cities have public wi-fi. But as I said, I cannot be away from Jakarta for too long. I also have to make sure that you’re fine with whatever it is you’re doing at the time and you’re not too far from me, so the most I would spend outside of Jakarta is one year. I still think that has something to do with where you are in your life right now. I travel a lot now! You do but most of the time you’re looking forward to go home. The stories of your travels from when you were my age are really different from how it is when you travel now. For example, you took a ship to Padang. Would you do that now? No, absolutely not. But would you take a ship? Of course. I’m still at a point in my life where I’ll try anything once. Moving on, you and your family (parents, brother, sister) were nomadic for quite some time. You grew up in Australia, came back to Jakarta, and then left for Canada for school. In which way did you long for Jakarta during your absence? What were the cultural shifts that you felt at every return? I was really young when our family moved to Australia, so I didn’t really remember much. But with Canada, there was definitely culture shock. It wasn’t really because of the cities, but because of Pearson college which really shook us. 200 students lived together for two years. There were four of us in one room. You ate, slept, and studied together, in a village in the middle of a forest. You become closer to your friends than your family. But it changed my life. Being abroad changed my life. And I always think that it’s one of the best things that happened in my life. It’s something that I couldn’t even write about. It’s too special and I was afraid, I am afraid until now, if I write a piece based on Pearson College, it will ruin my memories about it. But after Pearson College, I went to Trent University, and it was then I missed Jakarta. By the end of my 6th year in Canada, I knew that I had to go back home. I understand that because I think the cities we have visited, and especially the city we come from, becomes the blueprint of our work, but until now, I still can’t really write about certain things that happened in Essen. For me, it’s too special and I don’t want to share it with anyone else. I’ve written around it, insinuated, alluded, but I’ve never really written about what happened there that really changed me. There are certain things about Jakarta that I missed the last four years, and one of the things that I missed was being in the literary circle. When I was in Pearson College, I didn’t miss that, because everyone there was special, everyone was selected from each country, they were all artists, everybody had talent. I didn’t miss Jakarta at all, I didn’t miss the literary community. But then when I went to Trent, it was a typical, normal, university. And then I started to miss the literary community, Taman Ismail Marzuki. I started to miss watching Indonesian films, of course I watched Western arthouse films, it became the replacement, but still, I missed meeting with my Indonesian artist friends. And I missed writing. I missed Bahasa Indonesian. My Bahasa Indonesian had started to deteriorate. I had no one to speak it to, I didn’t write in Bahasa Indonesian. And then in 1986 I went back home to research for my thesis, and that was the time I started writing my short story collections, Malam Terakhir. The setting of the stories are mostly in Jakarta. We come from South East Asia, but we’re considered quite Westernized because growing up, we travelled and studied under Western curriculum. How do you reconcile the two culturally divergent identities, especially within your relationships? A similar situation is that we both had a relationship with a European man in our twenties. I never thought of cultural clashes, because both of us came from Pearson College. I mean, I usually explained to him things about Indonesia, Bali, Jogjakarta, Jakarta, but that’s like telling a story. We went to Indonesia together. I think the culture clash was when he got sick, because he couldn’t handle Indonesian food. That was interesting to me. I never thought anyone could get sick because of Indonesian food. There were no big cultural clashes. We never really had a serious conversation on religion, you know. It’s just that he understands that at the time, I was questioning a lot of things. I think it’s because at the time I was not thinking of marriage yet. We were still young at the time. What do you mean by culture clash? Like with Indonesians, when you’re in a relationship, you’re basically the same person. You’re together all the time, you don’t have secrets, you talk about your emotions. Max is German, so he’s more logical and individualistic. Emotions are very secondary. I think things like that is not a matter of culture, but character. Some things in culture influence our behaviour and the way we respond to things, but everything in relationships is based on character. We have a word for talking about our emotions: curhat (spilling out your emotions). That’s how much Indonesians talk about emotions. That’s true. You’re right. There’s no word for curhat in English is there? Anyway, there’s one thing you should remember. A city creates our character. Because of Jakarta, or any other city, it makes you creative. For example, when you’re stuck in a traffic jam for an hour to two hours, you’re forced to become creative. This creates an importance for gadgets: mobile phones and radios. We are forced into a situation where we can’t do anything. Maybe we can sleep, but not for so long. So we have to be creative. I’m not trying to put a positive spin out of traffic jams, but it does shape our character. We become more patient. And we become accustomed to finding alternatives. If there’s traffic, we find other roads, other alleyways. People who live in Jakarta also account for everything. If we have an event at 7pm, we have to be ready by 3pm. It will take at least two hours to get somewhere. Other cities don’t create such necessities. This factor created my character, as I’m sure it did towards other people. Living in Jakarta makes you tougher. There’s a popular saying in the city. “Jakarta keras, bro.” (Jakarta is tough, bro). 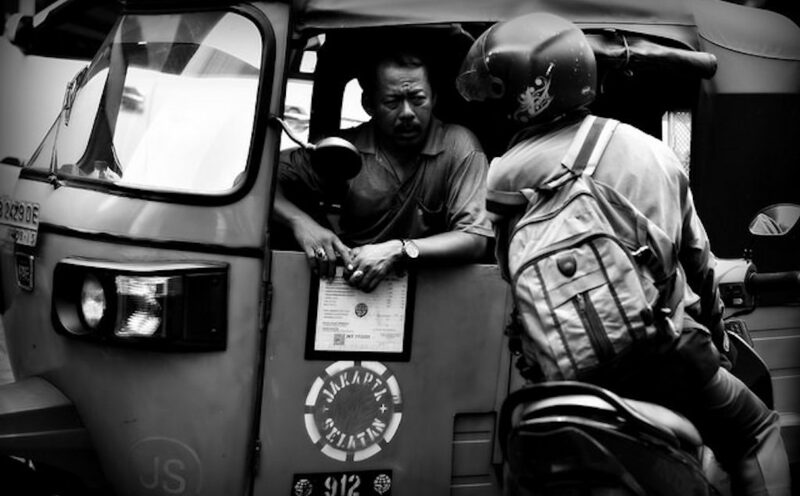 How much tougher has Jakarta become over the recent past? I don’t think it has become tougher, but uglier. When I was small, there were only two malls, Duta Merlin and Aldiron in Blok M, now there are hundreds. The thing you have to remember is the Jakarta of the past and the Jakarta of now is different. Jakarta was just Jakarta, now it’s Jabodetabek (Jakarta, Bogor, Depok, Tangerang, Bekasi). It became a megacity. These suburbs became Jakarta. We have to know the characters of the suburbs too now. A lot of people who come from the Central, like us, were removed to the South because the Central became really expensive. So younger people moved to the suburbs because it’s cheaper, and you can buy a house, whereas in the Central, you have to buy an apartment. These divisions make the city tougher and the government has allowed all the constructions of new buildings, so now there’s no place for us to breathe. We don’t have parks, or even trees anymore. It doesn’t only make us tougher, but angrier. This reminds me of Eyang Sari’s house in Central. It was one of the last historical, Dutch colonial houses that was still intact, but it was in an intersection in the Central district, by a railroad. You know that the house has been destroyed? It’s a good metaphor for what Jakarta is. Yes, it’s really sad. Our need for parks, or even just a space to breathe is not considered because of the greediness of the people. It doesn’t matter if they’re locals or foreigners. Anyone who comes into Jakarta, is a Jakartan. In some ways, Jakarta is a city of segregated city. North, West, East, Central, and South (now considered the center for everything). Growing up, for me, there has always been an importance in the South, specifically Kemang, Panglima Polim, Setiabudi, and more recently, Cipete. It’s the cultural hub, it’s where the galleries, cafes, concerts, events are. It’s where most people I know live and go to school. How has this division changed since you grew up? Everything was in the Central when I was growing up. Taman Ismail Marzuki was the cultural center. We ate in Taman Sabang, we hung out in Menteng. Jalan Cokroaminoto was very hip. Everything moved to the South because of Kebayoran Baru. It was the new Menteng, the new luxe, the nouveau riche. Then Jakarta expanded into the suburbs, so everything was centralized in the South. In a lot of your stories I can clearly see imprints of the Jakarta that you have personally known. In 9 From Nadira, you didn’t only model the family after us; you also modeled the house after ours in Tanah Abang. What importance have you placed within that area? In what ways has it influenced your upbringing and work? Jakarta in 9 From Nadira comes in many forms. Although it is true that the Jakarta in that book is set in the 1970s, in the Salemba Bluntas area where my grandmother’s house used to be. Jakarta at the time wasn’t as sophisticated as it is now, but for me, it was a much more stable environment because I knew where everything was and I could go everywhere alone. I remember during primary school, I would ride my bicycle with my friends, and we would go to the cinema near Monas. I don’t think parents would let their children ride their bicycle through the main streets now. Jakarta didn’t only become the background of my stories, it also shaped the characters. And then in Home, you created a deep yearning for Jakarta within your characters. Beyond the political importance of the city itself, it is also the sounds, the smells, the taste, the people that the exiles long for. Do you believe that a person can choose where they feel that they belong? Its’s not necessarily a choice. It’s a feeling. There are times I do not feel that I belong to my extended family because the Chudori’s are quite different, but we are a part of Masdoeki clan (my father’s father name). “Home” is a tribute to Indonesia with is cities, big or small, and to all Indonesians who could not go back home because their passports were revoke after 1965 tragedy took place and these Indonesians were accused as Communists. The deep yearning to go back to Jakarta felt real to me because I did feel that I missed something huge and important during my university years in Canada. Although I did not go through any political ordeal like the political exiles that I met in Europe, I do understand their longing. Growing up, you used to commute with trains, buses, bajajs, ojeks, and the now almost extinct becak. Now, you only use cars. Was it a change born out of necessity? What do you miss from using the old transportations? It is out of policies. We used to have becak, helicak, and bajaj (google them). No ojek yet during my time. Of course, bus and metromini. I miss becak and bajaj, they were a breeze. Do you think Jakarta is the kind of city that ages? (Or do you think that Jakarta has aged well, perhaps?) Do you feel that you have aged with it? Jakarta is a megacity, one of the biggest cities in the world, what qualities does one need, as a writer, and as a citizen, to operate in a megacity like this one? A writer (and journalist) like me needs to be strategic living in Jakarta. We need to be smart and creative to handle the ordeal (traffic jams, unpredictable weathers). We need to know when we can use a car or public transportation. And we also need to enjoy all the downside of Jakarta as a part of our observations as a writer.